My mom has made her own yogurt for years and I always looked at her bowl of rotten milk sitting on her counter with disgust. It seemed pretty hokie. I never actually tried it though (sorry mom). In my internet searching for whole foods recipes I came across this recipe and it intrigued me. I use a lot of yogurt at my house. Not only for eating plain but in smoothies and all sorts of other recipes. Yogurt is pricey, especially when you're purchasing the quality stuff. Well, to get away from the artificial colors, flavors, and sweeteners I decided to give this a go. 1/2 cup commercial plain yogurt that says “Live and Active Cultures” on the tub. I used Stoneyfield farms plain greek yogurt. In a large crock pot pour in the milk. Turn it on low for around 2 1/2 hours. After that time has passed, unplug the crock pot and let it sit for 3 hours. 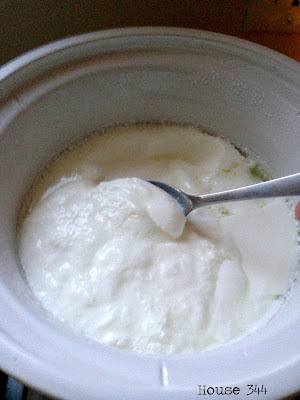 After the 3 hours has passed stir in the 1/2 cup of yogurt. Replace the lid of the crock pot and cover with 2 big towels or a blanket. (I just used one big towel. My mom just uses a dish towel.) Let rest for 8 to 12 hours (Mine was longer, I wasn't getting up at 3 a.m. That's why I was worried I was going to get sick. It ended up being 17 hours). In the morning you’ll have yogurt! 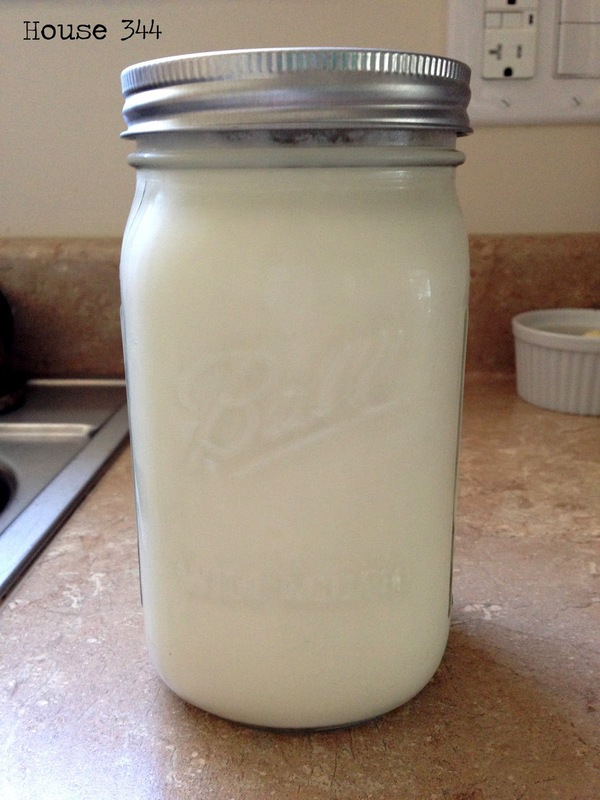 Put it in a quart sized mason jar and refrigerate for a few hours before serving. Mine filled up two jars with a small bowl leftover. It will thicken up in the fridge. 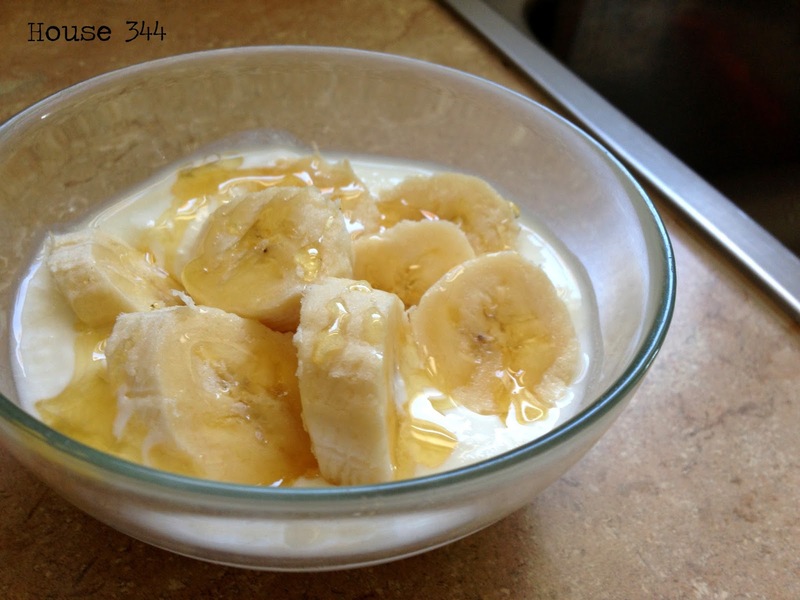 Don't forget to save 1/2 cup of your yogurt for your next batch. At this point I was worried about my safety. ;) It was cool to see the transformation though. I filled two of these quart sized jars. So I ended up with a half gallon of yogurt for approximately $1.25. Not bad! You can also let the yogurt strain in cheese cloth, in the fridge for a few hours and you’ll get a thicker Greek yogurt! Awesome. So glad it worked out. It feels great serving a wholesome product to the kiddos. I sliced a banana in it and drizzled honey. They loved it. Personally, I think it has a milder flavor than some of the plain yogurts I've purchased from the store. I love to make homemade yogurt. I've never tried this recipe with a crockpot. I use a recipe found from the frugal girl. You cook it, cool it down then add starter. Put into 4 qt jars and put in a cooler with hot water for 3 hrs. It is more time consuming than yours but really easy after you've done it a time or two. I love knowing exactly what is in it. Thanks for sharing!